Notes: "Danish psychedelic band Mew are releasing their first album in six years, +/-, in just a few weeks. We’ve already heard “Satellites” and “Water Slides” and today they’ve shared “Witness.”"
Notes: "New Order will release Music Complete, their first full-length album in a decade, this September, and on Tuesday, the dance icons unveiled the LP's first single and opening track, "Restless." The 10-year studio layoff – and loss of longtime bassist Peter Hook – does little to slow the band down. From its elegant, atmospheric opening and bright, anthemic choruses to frontman Bernard Sumner's trademark guitar tone and the welcome return of keyboardist Gillian Gilbert, "Restless" recalls New Order's 1985 LP Low-Life. Gilbert, for her part, rejoins New Order for the first time since 2001's Get Ready. Notes: "Don’t understand the name of Gwenno’s fantastic new album? That’s probably because you don’t speak Welsh. Although, you may have a better time working out the translation for one of the album’s stand out tracks and today’s featured song, “Patriarchaeth”... teaming with producer Rhys Edwards for sessions that would eventually produce her first proper solo album, 2014’s Y Dydd Olaf (“The Last Day”), which was given a wide release by Heavenly the following year. Named for the Welsh author Owain Owain’s dystopian novel, Y Dydd Olaf sounds appropriately otherworldly, albeit with a strong pop current running through its alien tones." Notes: "Chet Faker, that noted Australian musical wizard, has co-founded a label, Detail Co., and, given the quality of the acts that he’s signed thus far, the label is quickly becoming one to watch. Cleopold, an Australian singer-songwriter, is a remarkable musician signed to them now, and his debut single, “Down In Flames”, is a truly original piece of R&B-tinged pop that clearly pays reverence to Faker’s sound. Don’t mistake Cleopold as just another musical look-a-like, however, because, as “Down In Flames” demonstrates, he’s an artist with a rare songwriting ability and an instantly recognizable production style." Notes: "Finally, two years after seminal album Not Art, Big Scary are back as promised with new single 'Organism'... the single comes on the back of Tom Iansek's spine-tingling Splendour set as #1Dads, ushering in the final shows with the solo project before the Melbourne songwriter/producer turns his attention to Big Scary's new album. Iansek says the stripped-back lead single is about getting back to the essence of his dynamic with drummer Jo Syme." We heard Big Scary back in Spring 2014 on Episode105. Notes: "Before re-releasing their first full-length record, Patterns, last year on Lolipop Records, [LA four-piece] Froth were more of a joke than an actual band... The first single from their forthcoming sophomore record, Bleak, is entitled “Turn It Off”, an ironic choice for a song that’s purely explosive beach rock. The group has even been asked to record runway music for last year’s Saint Laurent Men’s line." Notes: "Telegraph Canyon are a six piece rock band from Fort Worth, Texas. The band releases their new album, You From Before on July 31st. It’s the band’s first new album in six years, and for fans of the band’s indie rock, rustic flavored sound... between Arcade Fire, Grant Lee Buffalo, and Band of Horses. Produced by Matt Pence and Will Johnson of Centro-matic..."
Notes: "The pop queen of lethargy, Lana Del Rey, sounds like she vaped a gram of Girl Scout Cookies before her vocal take for “High by the Beach.” Taken from her forthcoming album “Honeymoon,” the artist glides her way through the song as a gentle organ hums behind her and a sibilant high-hat sizzles up top... [Lana says,] "It's a little like a hip-hop record. It started with the chorus. I was driving by the beach a lot,” she said. “Even with the harmonies, it almost sounded monotone. But with the beat, it has this trap [music] influence."" It's Lana Del Rey's third go-round here on PUTV - and the update is: the new album drops 9/18. Notes: "Primarily consisting of leftover tracks from the Are We There sessions, the I Don’t Want To Let You Down EP saw release earlier this year, and “Just Like Blood” shows that even Van Etten’s leftover tracks pack the same emotional punch as her album tracks... “Just Like Blood” finds its momentum by attaching itself to a steady rhythm, allowing Van Etten to arrange melodic instrumental parts and her trademark harmonies in complimentary fashion." Sharon Van Etten gave Episode109 its "Taking Chances" title track- which was also back in Spring 2014. Notes: "This new CHVRCHES album is gonna be bananas. From all we've hard so far, their forthcoming sophomore album sounds like textbook ante-upping over everything that worked well the first time around. Iain Cook and Martin Doherty's synth soundscapes are a whirring, glistening trip, and Lauren Mayberry sounds even more confident in blasting out hooks." It's our third spin of Scotland's CHVRCHES and the second taste of the upcoming album. Notes: "Appleton, Wisconsin is not immediately thought of as a creative hub, but that works to Tenement’s advantage. .. Tenement’s latest record, Predatory Headlights, is a wildly fun listen, primarily because the trio covers so much stylistic ground across twenty-five songs... Even with high-profile praise from the New York Times and Grantland, Predatory Headlights still feels like a personal record... Tenement closes the record with the power pop sugar-rush of “Afraid Of The Unknown,” a song that virtually ensures you’ll take the album-length trip one more time just to get there again." "(I've Got) The Sanctioned Blues"
Notes: "With their sophomore full-length, [UK duo] Green Lanes, [Jack Cooper (Mazes) and James Hoare (Veronica Falls)] continue to craft languid psych-pop, combining their voices with wistful harmonies... “Songs that borrow the imagery and rhythms of the railway are as old as the railways themselves. We didn’t really set out to fit in with that tradition, but I suppose that’s where it’s at.”"
Notes: "Hustle Rose is an American soul and funk band with horns, synth, bass and drums... 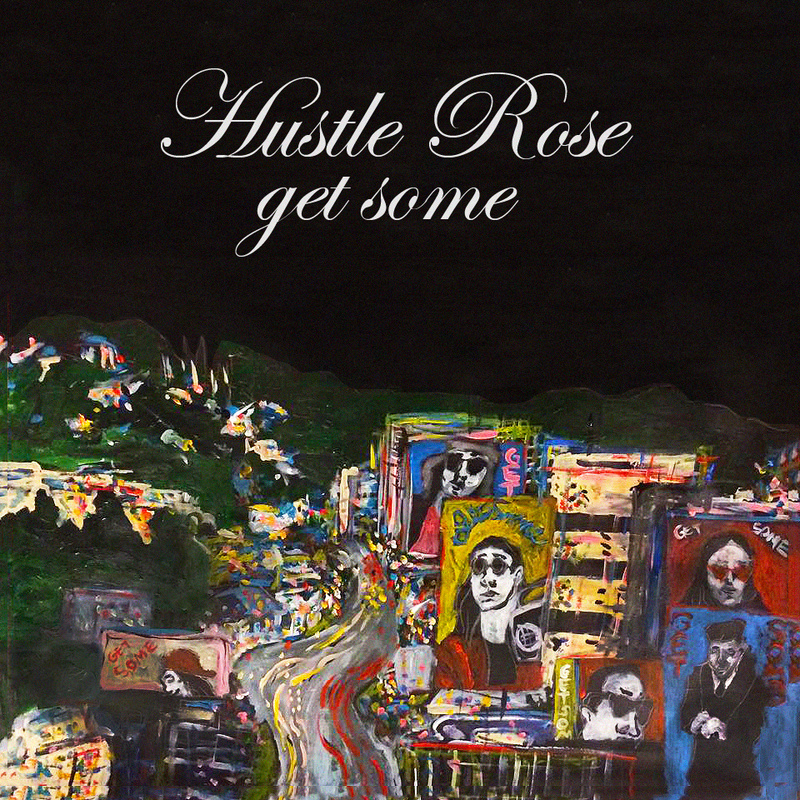 Originally from Minneapolis, Hustle Rose spent 2 years playing the Chicago scene and touring around the Midwest after their original EP Release, “The Sugar Water”. Now back to their MPLS roots, Hustle Rose is [dropping full-length 'Stay Up']." Notes: "The New York duo's fifth studio album is set to be a return to their guitar-driven sound, which has taken a backseat on 2008's LP3 and 2010's LP4. 'Cream in Chrome' already begins to demonstrate this move, with a minimalist riff accompanying a locked-in bass and drums which builds to an oriental influenced outro." Notes: "We still don’t know when narco-disco overlords Chromatics will release Dear Tommy, their much-anticipated Kill For Love follow-up, into the world. But we have heard a couple of new songs... “I Can Never Be Myself When You’re Around.” And now, the group has shared a third tune. Compared to most Chromatics music, the new “In Films” is positively buoyant... Rest assured, though, it will still sound great when you’re driving through abandoned city streets at night." And it's the fifth time we've heard from Portland's own Chromatics! Listen to Duran Duran's lovelorn new single "You Kill Me With Silence"
Hear 1st new song in 5yrs from mighty @IronMaiden, "Speed Of Light"